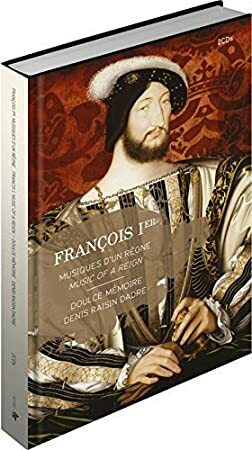 The new boxed set and book dedicated to the French monarch with the Ensemble Doulce Mémoire. NOTE: All of the music on this program is from the recording François I er, Musiques d’un Règne featuring the Ensemble Doulce Mémoire directed by Denis Raisin-Dadre. It is on the Zig Zag Territories label and is CD ZZT 357. (from Early Music Review): Francis I, as a princely patron of the arts, realised that music was a very useful tool for his policy of prestige: Official music for great diplomatic events like the amazing musical ‘tournament’ between the Chapelle of the King of France and the Chapel Royal of Henry VIII of England at the Mass for the Field of the Cloth of Gold, reconstructed in this recording; but also more intimate music with the exceptionally subtle, refined and learned repertory to be heard in the monarch’s châteaux such as Chambord and Fontainebleau, performed by the finest singers and instrumentalists of the realm under the aegis of the Chambre du Roi. Here is a feast of previously unrecorded music for King Francis I, the symbol of a happy Renaissance. This volume looks more like a book than a pair of CDs, with 132pp including monochrome pictures of the performers, the others being full colour facsimiles of pictures and music. The two discs are slipped into the front and back covers. The first is concerned with the Mass for the Field of the Cloth of Gold. This was a combined event, shared between French and English singers on 23rd June 1520 and led by Cardinal Wolsey and the Papal Legate. It would be interesting to prepare an edition for a celebration of the 500th anniversary which choirs and ad hoc bodies could enjoy, especially if the two nationalities were alternated as in the original. The pronunciation, however, was entirely French. There were eight singers and seven players – the 24 English trumpeters presumably were banned from the Mass. The second disc is concerned with the chanson (five singers and seven instrumentalists). The section on “women, music, and prohibitions” draws on the usual complaints of women singing in public: “With music the rude peasant lass, who is up before day to spin or weave, wards off her drowsiness and makes her toil a pleasure”! The music, however, is elegant, and presumably not related to peasant lasses. I’d be happier if the discussion of the chansons had been placed together with the sources, texts and translations. As it is, the contents of CD2 are more awkward to read than CD1. These reservations aside, this is an impressive publication.